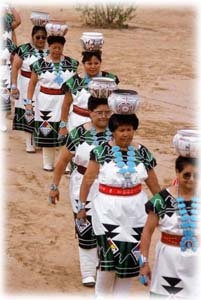 The Zuni people are in a way a mysterious tribe. Their culture is very reclusive and isolated much as is their city and their language. They are an interesting people who are well known for their beautiful artwork, sculpture, weavings and jewelry. The Zuni do three types of intricate jewelry, one of which is called petit point, the other Needle Point jewelry, and the last being Inlay Jewelry. Petti Point is identified by tiny turquoise stones each supported in its own bezel. It’s extremely time consuming to make and is very delicate in appearance. Thank you for reading our page about Zuni Native Americans, we hope you have learned a little bit about Zuni Inlay jewelry.